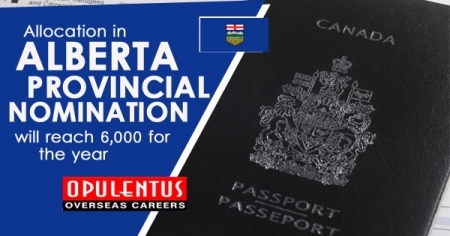 The immigration authorities of Alberta received an increase of 7 percent in the provincial allocation of the federal government nomination for the present year. Now it can nominate 6,000 candidates in its Alberta Immigrant Nominee Program. The figures for 2018 were 5,600. This increase in the nominations also has the share of 250 specific temporary overseas workers in National Occupational Classification C. This is a dynamic part of the NOC C initiative undertaken by the federal government. Alberta has issued 881 nominations in 2019, and also 1,600 applications are waiting in the assessment stage. In December 2018 the province reached its target in nomination allocation. This Stream permits the province in nominating some qualified applicants from the federal Express Entry System. Moreover, the qualified candidates are selected directly from the pool by the Program. Candidates have to get the invitation to apply prior to submitting the application. It aims at such candidates who have a strong relationship with Alberta and can also help in boosting the economy. Another goal is to increase diversity. International graduates also receive an invitation. Having an active EE profile in the federal pool. Specific interest in migrating to Alberta permanently. Having a CRS score of 300. A job offer and also some work experience. Completing the graduation from the institution in Canada. A relative, parent, child or sibling living in Alberta. Having a valid status of a Canadian temporary resident accompanied by a work authorization. Attaining CLB 4 in English or the Niveaux de compétence linguistique canadiens 4 in French in all activities for many NOC codes. Orderlies, patient service associates and the Nurse Aides, of the NOC 3413 also require CLB 7. Having 12 months of full-time work experience in present occupation during the past 18 months, OR 24 months of full-time experience in the present occupation in the country or abroad during the last 30 months. PGWP candidates must also have 6 months of full-time provincial work experience during the past 18 months. A net worth of $500,000 or the confirmation of accessing such funds. We provide the information regarding all such developments and you can contact us for any details.